Have you made that cinnamon challah yet? 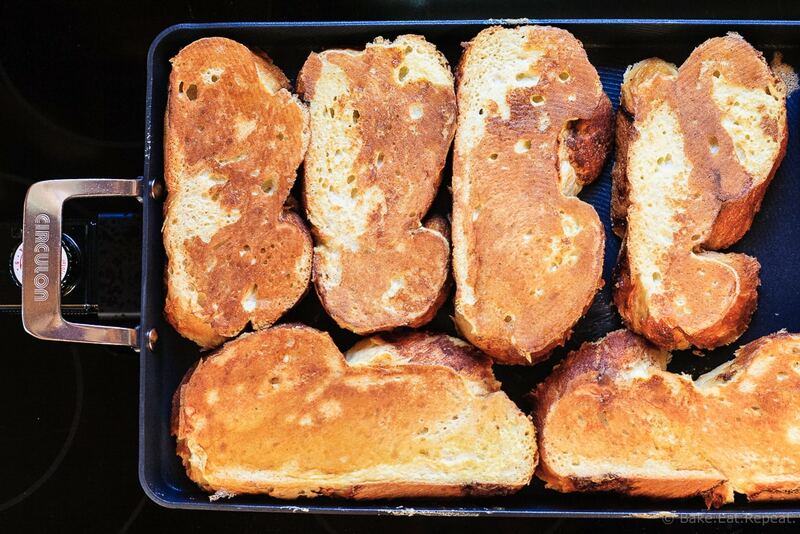 If not, get to it, because it’s super easy, and oh so amazing in this French toast recipe I have for you today! Or, you know, go buy a loaf of French bread, because let’s be honest, French toast is always amazing no matter what bread you use. It’s especially amazing with these cinnamon apples and cinnamon syrup, so if you’re looking for a perfect brunch recipe for the weekend, look no further. This one is fantastic. To make this French toast, I used my new Circulon non-stick electric griddle that Circulon Canada was kind enough to send me to try out. I have been wanting a large electric griddle for a while now, so I was pretty excited when they asked if I would like to review it. This griddle is by far the best non-stick pan I’ve ever used. It’s a bit different than traditional non-stick surfaces, with a hard anodized coating in a circular ridge pattern. It’s more resilient than other non-stick cookware, and you can even use metal utensils on it, without damaging the surface. That excited me a lot, because I do tend to grab metal utensils rather than anything else. The non-stick capabilities of this griddle are amazing. I have used it for French toast, pancakes, sausage, and anything else I could possibly use it for in the last month, and nothing sticks. You don’t have to use any kind of oil or butter or anything, and still, no sticking whatsoever. I’ve always thought the best test for non-stick pans is eggs, as most pans are good for most things, but eggs always need a little butter or something to prevent them from sticking like crazy. This griddle even works for eggs. No sticking at all. I was in awe. Plus, it’s huge! Making French toast or pancakes or something for my family of five usually takes a while, making four small pancakes at a time on my biggest skillet. I can easily make more than twice as much at once on this griddle. So much faster. I love it. The only thing I don’t love about this griddle is that the handles get quite hot, and it can’t be moved when it’s turned on without using oven mitts. This is a minor complaint though, and it certainly won’t stop me from using it whenever possible. You generally don’t have to move an electric griddle anyways. To be honest, the only reason I did is so that I could move the pan to a spot with better light for a photograph! Since normal people aren’t taking pictures of their food while cooking, this likely won’t be an issue. So if you’re looking for an electric griddle, I would definitely recommend this one. Plus, Circulon Canada was nice enough to provide a non-stick 7.5″ frying pan for one of my readers, so if you would like to try out this non-stick cookware, just enter the giveaway below. 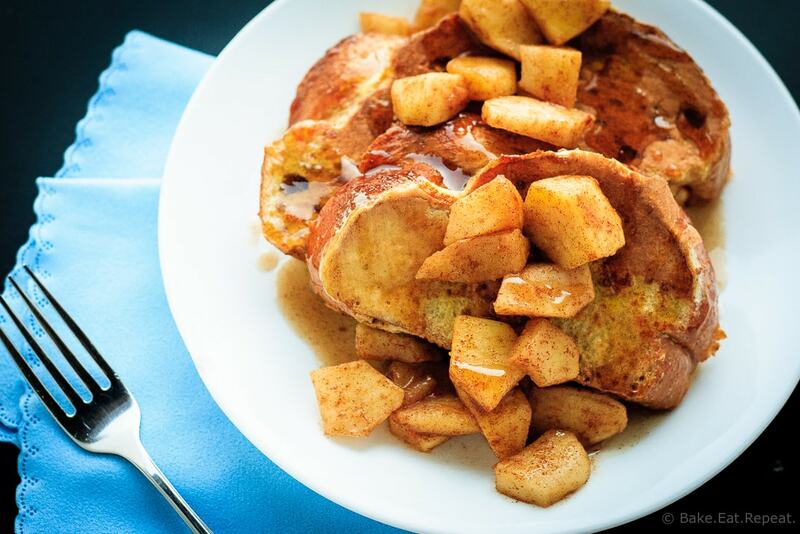 And then make some of this amazing French toast with cinnamon apples and cinnamon syrup. You won’t be disappointed! Disclaimer: Circulon Canada provided me with product for review. As always, all opinions are my own. b]Note:[/b] I used [homemade cinnamon challah (highly recommend this!) for this recipe, but it works just as well with French bread. You could add 1/2 to 1 teaspoon of cinnamon to the egg mixture if you are using French bread and would like cinnamon French toast. The recipe is best if the bread is slightly stale, 2-3 days old, not fresh baked. For the apples, I used gala apples which are quite sweet. If you are using a more tart apple, you might want to add 1-2 tablespoons of brown sugar to them, but I typically don’t add any sugar. The recipe makes quite a bit of cinnamon syrup, but it keeps in the fridge for several weeks. For the cinnamon syrup, whisk together the granulated sugar, brown sugar, flour and cinnamon in a small saucepan. Whisk in the vanilla and water until smooth. Bring the mixture to a low boil over medium heat, and then simmer for 5-10 minutes until it is slightly thickened. Keep warm until ready to serve. For the cinnamon apples, in a large non stick skillet, melt the butter and then stir in the chopped apples, cinnamon and nutmeg. Saute over medium heat, stirring often, until the apples are tender, about 5 minutes. Keep warm until ready to serve. For the French toast, preheat a non stick griddle or skillet to medium heat (for the Circulon electric griddle that I used, I cooked it at heat level #4). In a shallow dish, combine the eggs, milk, brown sugar and vanilla. For best results, use an immersion blender to combine it well, otherwise whisk everything together until smooth. Dip each slice of bread into the egg mixture, turning it to coat both sides, and lay it on the griddle. Let it cook for 2-3 minutes until browned, then flip to cook the other side. If you are making a large amount, the cooked French toast can be kept warm in the oven (about 200 degrees F) until everything is cooked. 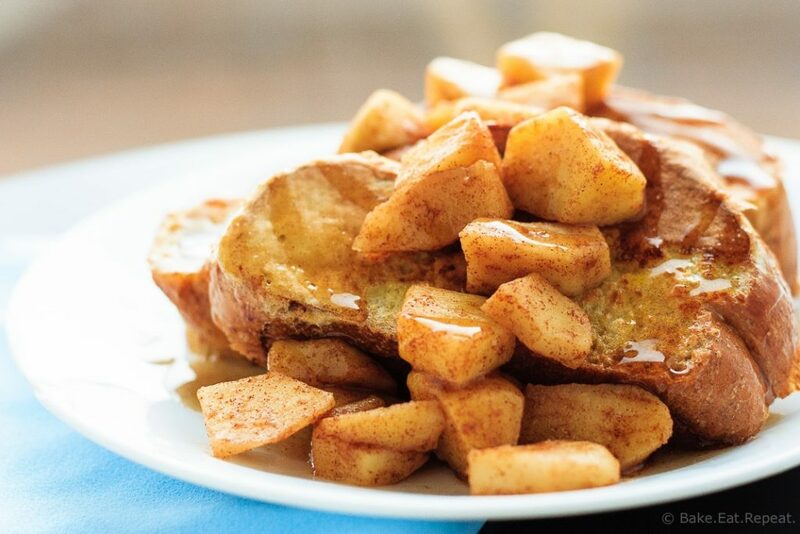 Serve warm French toast with cinnamon apples and cinnamon syrup. Enjoy! Source: Cinnamon apples and French toast recipe from Bake.Eat.Repeat., cinnamon syrup recipe from Mel’s Kitchen Cafe . This recipe looks perfect for a fall, family Sunday brunch! Can't wait to try it out. Thanks for sharing it! This looks really good, I even think I'll make the cinnamon bread first. You definitely should - it's absolutely amazing. I don't know if I'm ever going to want to make French toast with regular French bread again - even though that's pretty awesome too! Thanks Andrea - hope you like it! Wow. I love that you made an alternative to maple syrup. Not that I don't love it, but like you say, its better if we can change it up. My hubby has been making Saturday morning pancakes religiously for a year now. Perhaps its time we give French toast a try! Thanks! French toast is such a nice change from the usual pancakes! We love it. Plus, it seems a bit faster too, no batter to mix up I suppose! Hope you enjoy it, thanks! I would love to make a grill cheese sandwich with the new pan. If I had a new non-stick Circulon pan, I would use it to make breakfast, lunch and dinner. It looks perfect for pancakes, bacon, eggs. Ooey-gooey grilled cheese would be an easy clean up on this pan. For dinner I would grill burgers and garlicky hashbrowns. I would make eggs and bacon! Love French Toast, so that will definitely be on the fall menu. I think I will make some omelettes too. Perfect for fall! This french toast looks amazing Stacey! Can't stop looking at these apple pieces! Pinned! I love French toast, especially when its that deliciously looking and packs so much flavor. This is so perfect fro a chilly fall morning! You can never go wrong with French Toast - adding apples on top makes it even better! YUM! I haven't tried your cinnamon challah yet, but it's definitely on my list! 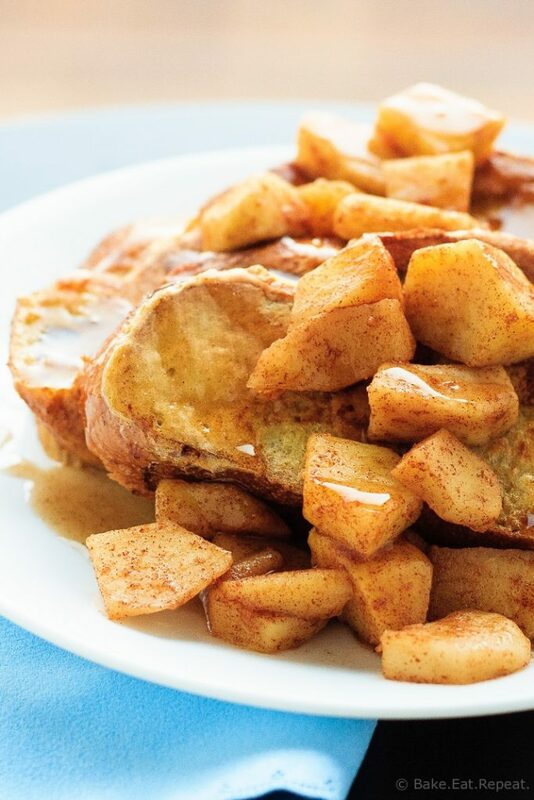 I'm loving all things apple right now and this french toast looks incredible! That nonstick pan sounds like something I would use all the time! Eggs of any kind are great for low carb meals. Want to try the cinnamon syrup with Splenda. Think it will work? Worth a try! I think it would taste a bit different, but would probably still be good. Let me know if you try it! I would make thick, hearty pumpkin pancakes in that beautiful frying pan! This breakfast looks like fall on a plate. Gorgeous and I can smell those apples and cinnamon from here! Yum, pumpkin pancakes. I think that's gotta be next on my list now! I love Autumn, and recipes like this is why! Looks divine! Best French toast ever!!! I'm a huge fan of cinnamon apples so this was right up my ally!! Awesome bread too Stacey!!! When do we get to eat it again?? I sure wish I would have some of this French Toast this morning! Looks just delicious! If this isn't the perfect fall breakfast then I don't know what is. Gorgeous! I needed an idea for Saturday Morning breakfast tomorrow. Thank you! Stacey this looks phenomenal! Perfect for fall... I'm in! Ohhhh!!! I have a serious craving for all things cinnamon apple. This looks wonderful! I love baked Cinnamon apples on french toast... and on crêpes or waffles!!! Mmmm, crepes. Need to make those again! And I agree, cinnamon apples are great on everything! This French toast looks amazing. Just wanted to say, I discovered your blog a few months ago and it is one of very few that I check regularly. Keep up the great work! Thank you so much Carly! That just made my day! :) So glad you enjoy the blog!